Al's first published article appeared (unedited) in the December 1955 Mechanix Illustrated, earning Al $80 plus a "ticket" to his optical career at Farrand Optical Co. from 1957—1973. 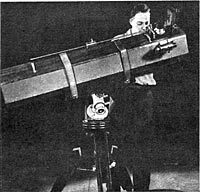 Note also Sky & Telescope Stellafane photo in October 1957 (he won 3rd prize in 1958) and Sky & Telescope Stellafane article in October 1972 where Al won 1st prize for his Newtonian. Al wishes you to particularly note the telescope "bargains" available in the 50's, and "migrating" hair styles. Click each image for articles in PDF format.